A new season, a new accessories guide. This budget-friendly bag guide is full of gorgeous spring bags that are all under $75. The majority of these retailers also offer free shipping! A few of my favorites are the trendy straw bags we have been seeing everywhere. I love this straw clutch with the pompom details, it’s only $26 with free shipping! Another great spring bag is this Chloe lookalike for an unbeatable price of $69.95. It’s the prettiest pastel pink color. I love all of the shapes, sizes and silhouettes of these bags. They all look like they could be a designer bag, but with a much friendlier budget. We’ve been really loving all the fun statement bags right now, so really loved this post! You found some really great budget friends bags. Thanks so much for sharing!! These are great budget friendly bag collections and i love all of them. Thanks for sharing this. These are all so cute and perfect for Spring babe!! Loving the lavender bag! I am loving all of these! That purple one might be my favorite though! Such a great color! Love all of these! A bag can really make or break a look. So many cute bag styles! Can’t wait to change up my bag style for spring. love love loveeeee that lilac bag!! great picks that are affordable too — thanks for sharing! I LOVE LOVE LOVE the one on your picture. I have been looking for a similar one. Though your round up is also cute! 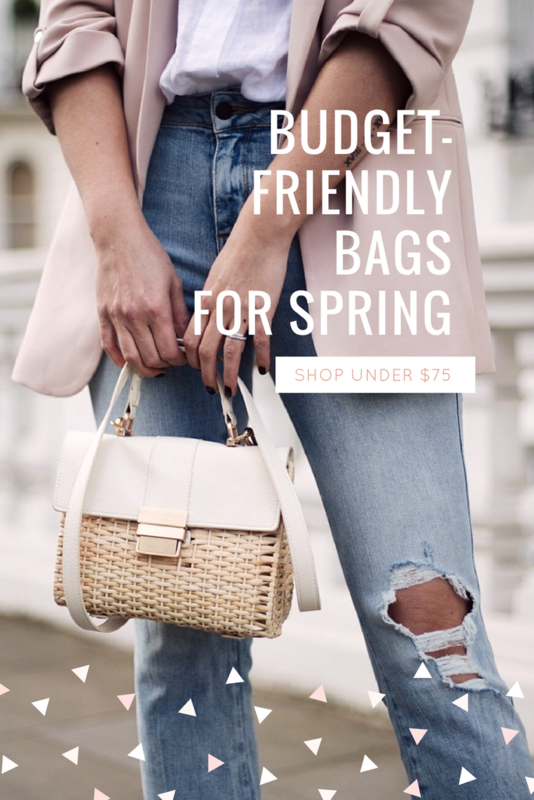 Oh all of these bags are great for Spring! The 2 blush bags are my favorite! omg that lilac bag has my heart! That Sole Society dupe is seriously the cutest! Oh I love all of these! That scalloped lilac one is especially pretty! Hello to the cutest little bags for spring! I actually just grabbed that one from target recently and love it!! So many gorgeous choices! They are all so beautiful! Love the one you’re wearing in your image. Totally my style.